What I’ll be sharing this week is all about the power of not giving up and the power of compounding results. It’s easy to want to throw the towel in when you’ve had a failure or even a series of failing moments, but it’s important to remember your why. I’m exploring four tips for you to try out when you feel the urge to give up on your goals. Join me for the concluding episode for my series on creating lasting weight loss! If you missed any steps, just go back and listen to the episodes and download the worksheets so you can start prepping to have the best 2019 ever. If you loved this series, don’t keep it a secret! Let others know that you’re enjoying the podcast. Remember to leave a review and that will help others find the show as well! 4 steps to help you not give up in moments where you fail. How to break the diet cycle and experience lasting results. The most important thing you can do when trying to change a habit. How “anchoring” can help you remember your why. The impact of compounding results. Alright, the struggle is real. I am a week out from Thanksgiving and I have a confession to make. I told you about my bold decision to drink wine just once a week. Well, it was Thanksgiving and we were out eating Italian a couple nights before the holiday and I didn’t really follow what I knew worked best for me. I drank wine on an empty stomach, my favorite full-bodied red wine, and during the meal I couldn’t really tell how full I was. I had another glass, had a drink later out with my family, no big tragedy. But I didn’t like it because the next day I felt horrible, and I really did in that moment resolve to do things differently. And not because I “should” because I am learning and know now that that’s what I want for myself. To really drink wine just once a week at most. And I felt so much better the rest of the holiday weekend when I stayed away mostly from wine and sip more slowly, and I’ll share more with you about that. But these moments, what I’m sharing with you today happens around those moments. It’s the times when we say we aren’t going to do something in particular or we are going to do something and we fail miserably, and that was a big fail. I didn’t feel good. Most times, these are the mini give up moments and they have a big impact on us, and especially on lasting weight loss, on really creating a relationship with food, a lasting habit that works best for you. So what I’m sharing with you today is how to not give up in those moments, what to do in them, I’m glad I have an example for you, and to remember the power of compounding results. And I knew, like you, that if I was really public about my not drinking wine once a week, I was just going to have a lot of confessions because this is not a clean process. But I’m getting head of myself. So I’m going to talk about two things. The power of not giving up, and we’re going to get to at the end of the episode, compounding results and how powerful that can be. Some shifts to new decisions can be clean and without drama. And others, my friends, can be a little messy. And around food habits, if we struggle with our relationship with food, they usually are a little messy. But the magic of creating a lasting change, of honoring what you most want for yourself are learning what to do in these fail moments and to use these fail moments for our own good. There are four steps to not only helping you to not give up but to understand how to turn them around. And first, my favorite, no judgment. In that moment of pure failure, you literally did what you said you were not going to do or you haven’t done a workout in a week and planned on doing three. Watch in that moment how you’re speaking to yourself. If you’re feeling like you failed, did something wrong, or feeling that rush of anger and frustration, this is the point to decide. Right here and right now, that being self-critical and beating yourself up only prolongs the moment. We think that “beating ourselves up” helps us to be motivated to change. But truly, what happens is we create all these lovely and I mean yucky emotions and when we feel these emotions, the last thing you want to do is to take good care of yourself. I don’t know, when I’m frustrated and angry, I want a glass of wine. I want the fluffy food. And in fact, in general, these negative emotions are usually the ones that drive us to drink more, overeat, and eat those fluffy good-feeling foods that are not fuel. So if you really want to break the diet cycle and want to experience lasting results, not beating yourself up in these moments, interrupting that judgment is absolutely key. So that’s your first step. Now, next is to decide what you want to do next time, even tomorrow, even the next meal. During my Thanksgiving example, I knew that I wanted to enjoy wine with our beautiful dinner two days later after this big fail. So I decided what I was going to do. I decided I was not going to drink alcohol all day and I was going to enjoy a very nice glass of wine during dinner, and I was going to go slow. And I knew I was going to wait until I had some food in my stomach, because this seems to be a real problem. Wine on an empty stomach for me is really an issue. And boy, did this make a difference. So, decide during your fail, right in that moment, interrupt the beat up, go, “It’s just one meal, it’s just one fail,” take a breath, and decide in that moment what you’re going to try next. Get creative. Honor what you learned in the fail. For me, it was just really planning and deciding ahead of time and knowing that that first emotional night that we were all together as a family we had a lot of memories around that dining table. Two years ago, my son graduated and we were there and it was a miracle what had happened in his life. And here we were, all together with my boys and their wife and respective girlfriend, and I was excited. So I needed to decide ahead of time how to handle those big moments. That’s what works for me. So for you it might be less on your plate, slowing down, make sure you have more fuel choices on hand, or look ahead to those moments that you are challenged with honoring your best decisions and really make a plan. So decide in that fail moment what you’re going to do next and for me, I decided what I was going to do on that day that I was going to drink alcohol again, but again, I didn’t even drink the day before Thanksgiving. I knew what I wanted to do though on Thanksgiving Day. Last but not least, remember your why. And remember like most how it feels in that moment. Remember both the positive and the negative of what’s going on for you in this fail. So for some people, it’s really good to journal in these moments. How do you feel emotionally and physically? I call it anchoring. And I don’t spend a lot of time anchoring negative moments, by the way. I think anchoring the good ones are much more important. But if you note what really happened, and for me, it was headache, groggy, my stomach was quite upset, and I was about to do go a really big workout. And I know that I was a little more dehydrated, and I went to a Soul Cycle. So I know it probably hurt more doing that workout than it would have if I had not had wine on an empty stomach and overdid it. So I anchored that both physically and emotionally, and remember how we did it emotionally, I looked at that moment and it was a really emotional, fun event. That’s when my overeating happened when I was young. So I know I need to plan a little better or just be more mindful before I order, before I engage in an event. Especially an emotional event. Anchor it. So I also will tell you, I felt so much better during that entire day. The day after Thanksgiving, I went on another workout with me – there’s a theme here. My daughter-in-law took me to another workout on Friday and it felt so much better because I’d not had but that one glass of wine on Thursday. So I’m sorry I’m digging so much into my own example, but I want you to see really most truly that it’s messy in the middle. I’m trying to change a habit that I’ve done really for a long time, and I am willing to fail quite a few times until I get it how I really want it. And I know I really want to be drinking wine just once a week, if that. So I just go back to and understanding that beating myself up in that moment, and I really was tempted to do that because I’ve been so public about it, right? So it’s a little embarrassing. But it’s really created such a great learning for me. I hope you can create those learning moments for yourself. Be kind, look what works, an anchor it. Just anchor that for yourself. Alright next, the absolute most powerful thing that you can do in changing a habit is remember that it’s not a perfect process, but when we compound our behavior, when it’s more days than not, we compound those results, and I’m going to talk a little bit about that. Remember that this practice is not about perfection or all or none behavior. Your body is so resilient. A few missteps of overeating or eating too much joy food or having a big binge even is not going to tank your efforts of losing weight, if you remember this. It is the days that add up with taking great care of yourself that truly make a difference. And again, if you’re listening to my advice about not beating yourself up, that shortens the all or none behavior. We don’t give up in those moments, we go right back the next meal, the next opportunity for a workout, whatever it might be, and it’s those compounding positive results that really make a difference. And I’ll tell you that 85% healthy behavior, that’s about what I’m at. Some weeks it’s 80 and I’ve maintained my weight for 10 years. When I want to lose weight, I ramp it up. I get a little cleaner, but it’s not a huge all or none tweak. It is really about 88% to 90%, and I can lose weight. So the best part is remembering how resilient your body is and that compounding results, mostly positive choices most of the time will create permanent weight loss. Learn things by the fail moments, how you feel, what happens for you when the scale goes up. Really learn in those moments but go right back to what works. If you’re anything like me, I see weight project as a project. Not only to complete but also want to do like a straight A student. Truly. Well, the body just doesn’t work that way and a good thing, because one day that ranks up there in terms of F behavior and in terms of self-care does not create a failure around weight loss. Your brain just wants you to think that you’ve failed. It’s not true. This might help you understand what I’m getting at here because if you’ve not done it with food, I want to show you have done it. What have you done in your life that you do regularly without thinking about it? Think about your examples. I’m going to share mine to prompt yours. Really think about it right now. I do yoga once a week and I’ve done that for a year and a half. I brush my teeth all the time. Sounds kind of trivial, compounding results. Drinking water. For me, writing 30 minutes every day for my business. Meditation is actually something I’ve not done and now I’m going back to. Getting to work on time. Is that something you’ve done? Has it paid off for you? These seem like very small things. Eating something green each day. Or always shopping when you’re out of town. Small but consistent habits. But at some point, I want you to remember that these were new to you. It took a decision and then a commitment and hanging in there when you failed. You didn’t always do it perfectly. There’s days I fall asleep without brushing my teeth. There’s days I don’t drink a bit of water. Guess what? They’re usually on the days I drink wine. Isn’t that fascinating? But at some point, these habits were new to us and again, it took a decision, a commitment, and to hang in there when you failed. Look at the impact that these compounding results have had in my life. Okay, I’ve always brushed my teeth. I was gifted with healthy teeth, but I’ve always brushed my teeth, and I have healthy teeth. Think about that for you. Again, it sounds so little but it really is true. Yoga, I no longer have back pain. I also know and have learned what my body needs by being in a practice of yoga. Some days it’s a child’s pose and some days it’s a warrior. But I know that I have learned so much about what my body needs. I’ve been in my body more by doing yoga just once a week. Drinking water. I’m less achy, I do it without thinking, and I feel better. When it’s cold, I heat up a glass and just drink water. But what is it for you? One thing I’m doing in my business, and this will be something you might hear about too because this is the one I’m working on, I’m writing 30 minutes a day. And you know what it’s created? More podcasts on time and actually getting ahead. You know, it’s just 30 minutes a day and I noticed this during Thanksgiving, I even did it during my vacation. I got up early. It was almost like a brain dump of everything I was thinking about for my next podcast or my business or a new program, and I would just get it down on paper on the proper files and then I was able to really enjoy my family and not fuss about my business. So if you’re having that work-life balance challenge, I highly recommend this. 30 minutes. Work, whether it’s email or whatever, just do it. But again, I cannot wait to see what the compounding result is in six months. That’s what I want to get at here. This is doing things in the moment. Not giving up. Remember, not giving up plus compounding results, looking at your effect in three to six months. It’s an amazing opportunity for you to have what you really want in terms of weight loss. I want you to be sure to check out my worksheet at dianamurphycoaching.com/CEO9. In this worksheet, I’ll walk you through the steps noted today and give you some great life hack tips that I give to – especially in workshops that I do. So they’re there for you. These have helped my clients get more consistent, even in the busiest of seasons. You know, here we are in the end of the year. Remember, it’s all about not quitting, compounding your results, and seeing those lasting results in the long term. This does conclude my series of creating lasting weight loss. 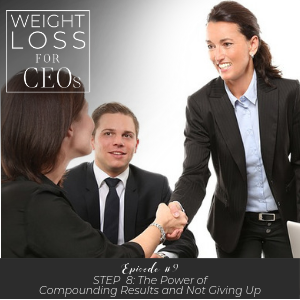 If you missed some of the steps, just go back to my podcast, Weight Loss for CEOs in episode one and you can go through my program by yourself by listening to the podcast, download the worksheets, wait until you’ve really gotten that step down, and then go back. That’s why I planned this series. I’ve already planned the next one and I cannot wait to share it with you. It’s a secret. You’re going to have to listen next Monday. Stay tuned and get the support and transformation you need by listening in every Monday and share. Don’t keep this a secret. Really let others know that you’re enjoying the podcast and let them get those insightful tips. I don’t know about you, but I’m setting things up around here at DM Coaching and in my own personal life to have the best 2019 ever. The best year ever. Join me. Dig into this podcast. Choose something that you know if you did it and compounded that result, choosing a green thing every day, drinking more water, one workout, getting up and stretching between all your calls, whatever it is in your business, do this. See what the compounding result will be in three to six months. I can’t wait to hear. Alright, join me in this challenge and I have so much more for you. See you on the next podcast. Thanks again so much for listening, and if you feel so moved, leave a review. That will help others to find it as well. Have a great day.